Hip 729, an American Pharoah colt, sells to OXO Equine for $1.4 million at the 2018 Keeneland September Yearling Sale. 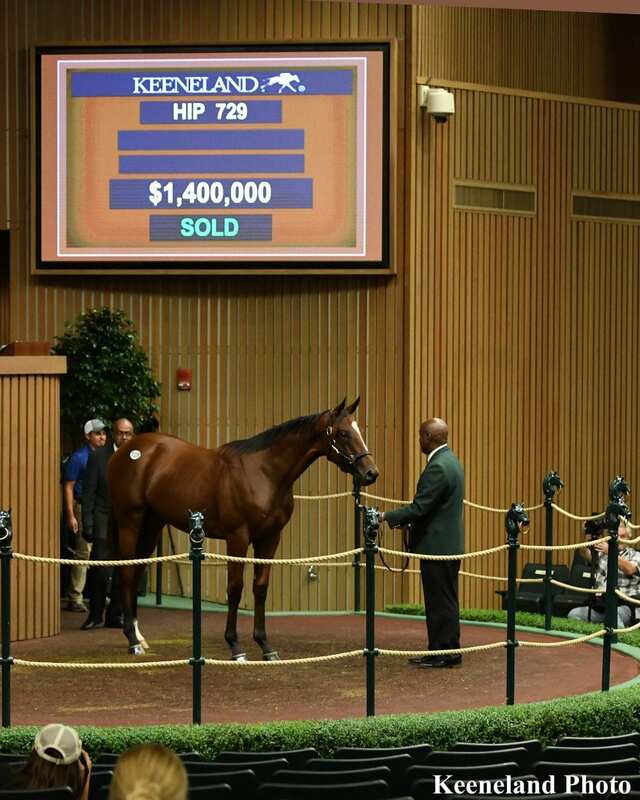 A booming upper market continued to generate big returns during Wednesday's third session of the Keeneland September Yearling Sale, led by a $1.4-million colt from the first crop of Triple Crown winner American Pharoah. At the end of three sessions, a total of 20 yearlings had changed hands for seven figures, marking the most for the bellwether September sale since 2007, when 32 horses hit the mark. It would take a heroic opening of wallets to catch that number, but with one session left in the auction's select Book 1 on Thursday, the milepost remains in play. Wednesday's session saw 151 horses sold for revenues of $52,883,000. The average sale price closed at $350,219, while the median finished at $270,000. The buyback rate closed at 27 percent. In total, 457 horses have sold over the first three sessions for $167,338,000. The cumulative average sat at $366,166, the median was at $280,000, and the buyback rate rested at 27 percent. A late flurry of million-dollar horses was topped by Larry Best's OXO Equine landing Hip 729, an American Pharoah colt for $1.4 million. The bay colt is out of the Grade 2-winning Pulpit mare Bsharpsonata, whose four foals to race are all winners, including Grade 2-placed Vigilante, Grade 3-placed Play It Loud, and stakes-placed Mihrab. Bsharpsonata is a half-sister to Grade 2 winner Backtalk. “At Fasig-Tipton [Saratoga], I bought an American Pharoah filly, so I felt like I was empty without a colt,” Best said. “I wasn't sure I was going to find an American Pharoah colt that I liked, but I liked this one enough. Still, it's required that you hope and pray that they can run. The colt was offered as property of Ed and Sharon Hudon's Sierra Farm, which bought Bsharpsonata with the future session-topper in-utero for $375,000 at the 2016 Keeneland November breeding stock sale. Farm manager Michael Callanan said the colt was the most expensive yearling ever sold by the farm. “I think American Pharoah is going to be the next Frankel,” Callanan said. “I think he's going to be a dominant force. He is a phenomenal sire, he's got an unbelievable mind, and he's just an incredible athlete. We've bred three mares to him, unfortunately we lost one, we sold one earlier in the sale privately, and we've got this guy. After partnerships commanded the early portion of Wednesday's session, the Dubai royal family took command in the mid-to-late portion of the day, landing a trio of seven-figure horses. Sheikh Hamdan bin Rashid Al Maktoum's Shadwell Estate Co. Ltd., landed the new session-topper, Hip 696, a War Front filly, for $1.2 million. The bay filly is out of the Irish Group 3-placed Galileo mare Betterbetterbetter, who herself topped the 2013 Fasig-Tipton Kentucky Fall Select Mixed Sale when she sold to Mandy Pope's Whisper Hill Farm for $5.2 million. Her first foal, a War Front filly named Intisaar, also sold to Shadwell for $1.45 million at the 2015 Keeneland September sale. The filly's extended family includes Group 1 winners Yesterday, Quarter Moon, and Diamondsandrubies, along with Group 2 winner Thomas Chippendale. Pope, known for being a high-end buyer in both the yearling and broodmare markets, has been an active seller at this year's Keeneland September sale. Her slate of offerings also included a Tapit colt out of Horse of the Year Havre de Grace who sold to Mataichiro Yamamoto on Monday for $550,000. Her horses are consigned by Timber Town. Later in the evening, Shadwell picked up Hip 730, a Medaglia d'Oro colt, for the same price. The bay colt is the second foal out of the Irish Group 3-placed stakes-winning New Approach mare Bunairgead, from the family of Grade 2 winners Storm and Sunshine and Smile Again. Taylor Made Sales Agency consigned the colt, as agent. Sheikh Mohammed bin Rashid Al Maktoum's Godolphin struck on Hip 703, a $1.1-million Uncle Mo filly out of the Grade 3-winning Afleet Alex mare Bizzy Caroline. The dark bay or brown filly is from the family of turf champion Lady Eli, as well as Grade 2 winners Tejano Run, Changing Ways, Pays to Dream, and More Royal. Stroud said it was likely the filly would remain in the U.S. to race, but the decision would ultimate be up to Sheikh Mohammed. Runnymede Farm consigned the filly, as agent. True to form with the racing side of the Thoroughbred industry, partnerships between major establishments have had a big presence at this year's Keeneland September Sale. A pair of big-time teams have set the pace during Wednesday's session, each securing their lots for $1.1 million. The potent combo of China Horse Club and WinStar Farm CEO Elliott Walden's Maverick Racing was the first to pass the seven-figure mark, going to $1.1 million for a War Front colt. The bay colt, Hip 509, is the first foal out of the unplaced Street Cry mare Tiffany's Honour. His second dam is the 2007 Broodmare of the Year Better Than Honour, putting him in the family of champion Rags to Riches, Belmont Stakes winner Jazil, Breeders' Cup Marathon winner Man of Iron, and Grade 2 winner Casino Drive, among others. Later in the session, the partnership of Three Chimneys and Peter Brant's White Birch Farm went to the same price for Hip 578, a Quality Road colt. The bay colt is out of the winning Mineshaft mare What'smineismine, whose first foal to race is a winner. His extended family includes Grade 1 winners Spring Quality and First Approach, Grade 2 winner Alice Springs, and Grade 3 winner Holiday Star. “He was a hellacious mover, and every day he got better and better,” said Shack Parrish of consignor Indian Creek. Last year's Keeneland September sale saw a similar transaction, with White Birch Farm partnering with Coolmore for the $1-million Quality Road colt Sagaponack, also consigned by Indian Creek. Stonestreet Stables went back to the well to land Hip 740, a $1.025-million Ghostzapper filly who is a full sister to Grade 1 winner Molly Morgan, a member of the Stonestreet broodmare band. Both of stakes-placed Distorted Humor mare Capitulation's foals to race are winners, and her extended family includes Canadian champion Wavering Girl and Grade 2 winners Tricky Creek, Parade Ground, and Parade Leader. Barbara Banke's Stonestreet operation bought Molly Morgan as a broodmare prospect for $1.35 million at the 2015 Fasig-Tipton November sale. Molly Morgan's first foal, a Curlin colt, sold to OXO Equine on Monday for $1.8 million. Banke said the decision on a trainer for the filly was still to be decided, but she would first be sent to the Stonestreet Training Center in Florida. Woods Edge Farm consigned the filly, as agent. This entry was posted in Bloodstock, NL Article and tagged Better Than Honour, china horse club, indian creek, keeneland september yearling sale, Lane's End, maverick racing, mick flanagan, Quality Road, Shack Parrish, Three Chimneys, Tiffany's Honour, war front, What'smineismine, White Birch Farm, winstar farm by Joe Nevills. Bookmark the permalink.